Chemical-Free Anti-Aging Treatments for $1 a Day! I don't know why, but when I hit 35, my skin took a nose dive toward "aging." My usually smooth skin started showing wrinkles and dullness. I had been faithfully using some over-the-counter beauty products with wrinkle treatments in them, but I found these unusable after my last child; my face would react horribly to most of the chemicals in them. What was left for me to do? In addition to making preventative care my number one priority via sun protection in my moisturizer (I don't just want smooth skin, I also don't want skin cancer), I wanted something that could help take the fine lines away and deal with "dullness." 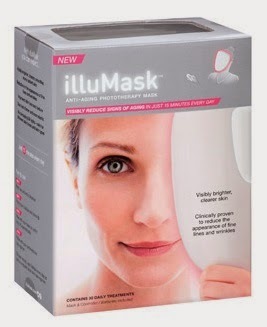 I was asked to try the Illumask, which is available now at Walmart for under $30. This mask comes in 2 types: Anti-Aging (which is the one I tried) and the Anti-Acne. How it works is simple. Take the mask out of the box, put in on your clean, dry face, and push the power button. 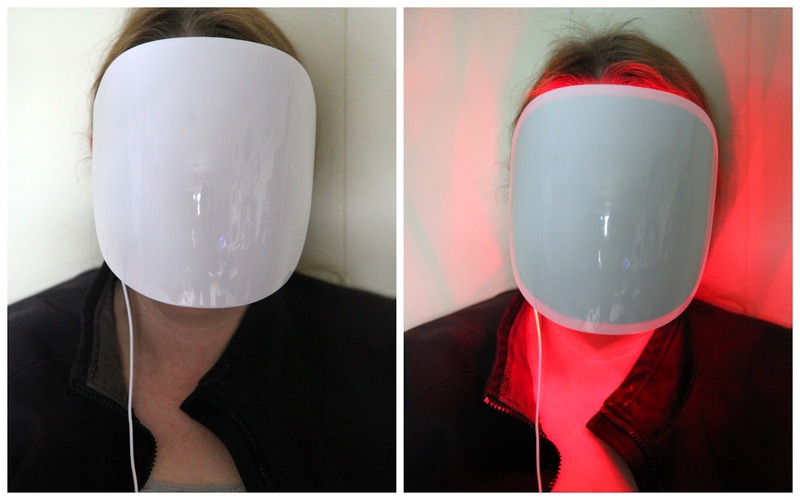 The mask does all the work of treating your face with safe phototherapy via red and infrared lights. Your eyes are protected, as dark lenses are built into the mask. The treatment stops automatically after 15 minutes, meaning you can't overdo it. Since light bulbs degrade over time, and the option to treat at home is a pretty neat privilege (no time taken to visit the spa/doctor and you don't have to pay for the visit), the mask is only good for 30 treatments. After that time, it won't power on, and it's time to buy a new mask. Because of this feature, you'll want to be sure to have a full 15 minutes available for a treatment (there is no "pause" button), and kids will need to stay away from your mask so that they don't accidentally turn it on and waste a session or two. Did it work? Yes. The manual says that you could possibly see improvement in your skin by 2 weeks, but I was seeing brighter skin and the diminishing of tiny wrinkles around my eyes by day 4. This may be because I consider my skin to be much younger looking than, say, someone who has experienced time out in the sun their whole life. I would imagine that using it sooner in your aging process would show results sooner. I think that the most exciting thing about this product is that it brings to light the signs of aging in ways I never realized. I have been battling a droopy chin for years; it's a family trait. I lost some weight after my last baby, and was disappointed to see that my full chin never really went away like it did with previous weight loss victories. Using the mask, however, really did quite a bit to tighten that area. It turns out that, over time, my chin and neck skin was losing elasticity and falling down, independent of weight gain. Firming up my skin has helped this issue that I am very self-conscious about. If you are looking for a chemical-free way to treat skin, this is a good option. One thing to note is that the manual says not to use it if you are pregnant or nursing, as it really hasn't been tested on women in these conditions. As with any beauty treatments, however, it is best to discuss it with your doctor if you are unsure; this blog post is not intended to offer medical advice.